• This year begins the inauguration of the 13th NPC, which will run until March 2023. • China’s NPC of around 3,000 delegates will meet in March 2018 and will likely re-elect Xi Jinping for another five-year term. • The meeting will see the announcement of China’s annual military budget and progress on its five-year economic plan. • The NPC is a key part of the Chinese system of ‘consultative democracy’, which theoretically channels the will of the people. • The NPC is well suited to take on a central role in the implementation of changes and the driving of new policy initiatives. The Chinese government has recently caused a lot of speculation about the political future of China through the release of a two-sentence press statement stipulating constitutional changes. Published through the state-run Xinhua news agency, the memo states that the Xi administration has proposed a constitutional amendment to remove language indicating that the offices of President and Vice-President are to be limited to two five-year terms. The plausible intention of President Xi to remove an obstacle to extending his own tenure, long a subject of speculation, has cause a furor in the international media landscape. An important aspect in this debate, however, is the nature of the Presidency of the PRC and the relationship between the Chinese people, the legislative and China’s top leadership. In March 2018, China’s legislative deputies will convene in the Great Hall of the People to discuss and vote on the most important matters of state. Officially called the National People’s Congress (NPC), this is for all intents and purposes the PRC’s parliament and is granted significant powers over the affairs of state. Importantly, it is the sole body able to change the state constitution and dismiss senior members of the executive, more to the point, the NPC is charged with electing the Chinese President to a five-year term and making changes to the Chinese constitution. Yet for all its significance, the convening of the NPC’s inaugural session and election of China’s head of state has so far received relatively little attention outside of China, certainly when compared to the fanfare reserved for the National Congress of the Communist Party of China in October of 2017. Observers of Chinese politics are almost universally agreed that the NPC plenary session will confirm the reelection of incumbent president Xi Jinping. Although the post is open to any Chinese citizen with full voting rights above the age of 45, by the time the NPC convenes for the Plenary Session at which it will vote on the office of president, the pool will already have been narrowed down to a single candidate – the Secretary General of the Communist Party. As in most political systems with a Marxist-Leninist legacy, the PRC’s voting system is structured to be confirmative with delegates voting for, against or choosing to abstain, as opposed to being competitive with candidates vying for some legally defined majority of the support pool. Since 1993, the post of President of the PRC has been held by the leader of the Communist Party and every incumbent has been re-elected to a second term. Given this precedent and the current political structure of China, the reelection of Xi Jinping as President of the PRC seems certain. That being said, China’s political process is currently undergoing a major, if gradual, overhaul. 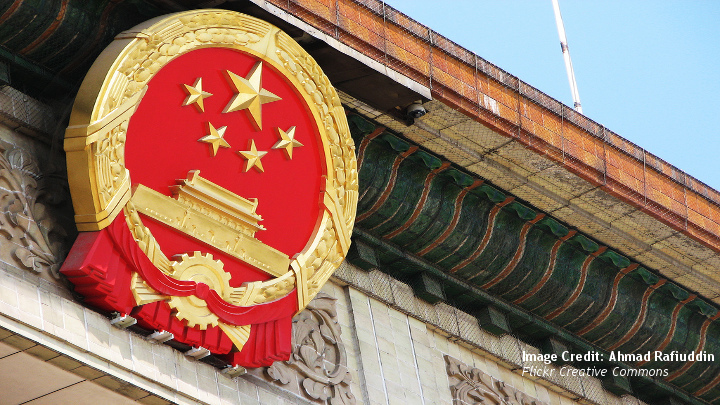 The process by which senior government offices are awarded, as well as the relationship between China’s executive and legislative branches of government, yield insights into the direction that Chinese politics may take in the future. To better understand China as a whole, it is important to look at the office of President, the National People’s Congress and some of the impetus driving the Communist Party’s embrace of what it views as “Socialism with Chinese Characteristics for a New Era”. Chairman, President or General Secretary? Chinese politics is a maze of titles, rankings and orders of precedence that can be difficult to grasp at first glance. The opaqueness of the upper levels of the PRC’s leadership and the practice of government through consensus and precedent do not help in better understanding the changes taking place in China. When unpacking events like the upcoming inaugural session of the National People’s Congress and the Presidential election that runs alongside, it is important to keep some core concepts in mind. Xi Jinping is in fact the seventh person in the history of the PRC to hold the title of president. The first person to hold this office was Mao Zedong, who assumed the role of president (or State Chairman as it was known at the time) in 1955. From a linguistic perspective an important alteration has been the change in translation convention of zhǔxí as “president” as opposed to “chairman.” This creates an apparent disconnect between “Chairman Mao” and “President Xi,” for an English-speaking audience which is not shared by a Chinese domestic audience for whom the titles are similar. This is not to say that the office has not changed, but rather that there is more continuity than may at first strike a casual observer of Chinese history. Under the current constitution, the office of President is considered to mainly have a ceremonial function. Yet no serious commentator on China’s politics would consider the man currently holding the office of President – Xi Jinping – as having a predominately ceremonial function. The office of President of the PRC has evolved to be held concurrently with the office of General Secretary of the Communist Party of China (CPC). Therefore, in practice, the head of the CPC is simultaneously the head of state. Added to these two roles is the position of Chairmanship of the Central Military Commission (CMC), in effect the highest post in China’s military hierarchy. Thus three separate, vital state offices are simultaneously held by one person – China’s paramount leader. The way in which the office of the president is bestowed upon the General Secretary of the CPC, however, gives a good explanation about the way in which politics have developed and how the machinery of government, as well as its checks and balances, is supposed to function. Legally speaking, the president serves at the pleasure of the NPC, and it falls to the legislature to both elect the president and make changes to the constitution. Structured as a unicameral representational body by the Chinese constitution, the NPC is the world’s largest parliament by number of members and is the de jure highest government institution in China. Elected to a five-year period, it holds an annual plenary session in the Great Hall of the People in Beijing, usually every March, for a period of 10 to 14 days. The 12th and sitting NPC, which first convened in March 2013, presently consists of 2,987 delegates with Zhang Dejiang as its chairman. With its mandate set to expire, the 12th NPC held its last plenary session in March of 2017, and is in the process of handing over the reins to the incoming 13th NPC. The plenary session this March will be the inaugural session of the incoming legislature, and will serve as the venue at which President Xi’s presidential mandate will likely be renewed. If past sessions are any indication, this will also be when the PRC’s annual military budget and reports on the progress of China’s five-year economic plan are made public. The deputies who make up the NPC are drawn from every part of China and number just under 3,000. In order to get a more or less even spread of delegates from the country’s diverse provinces, autonomous regions and special administrative zones, the law provides for the outgoing NPC’s Standing Committee to oversee the distribution of representative mandates during the process of NPC elections. These are held progressively over the course of a year through a process of indirect elections in successively larger people’s congresses, effectively local councils that vote for or against nominees. The number of candidates running for elections in the national or local people’s congresses must, by law, be greater than the number of seats available.The deputies are drawn from 35 electoral units divided between China’s provincial and regional administrative units, as well as from the ranks of the People’s Liberation Army (PLA). There are also special representatives for Hong Kong, Macao, and Taiwan. Each province-level unit is allocated a minimum of 15 seats in the legislature, which are augmented by one seat for every 670,000 inhabitants. A province like Sichuan with 81 million inhabitants would, therefore, receive about 120 extra seats, while a province like Jilin with a comparatively low population of 27 million inhabitants would be granted a further 58 seats. The 13th NPC will also have 36 deputies representing Hong Kong, 12 representing Macao and 13 representing Taiwan, the latter of which are predominately born on the mainland or members of the PLA. At least one seat is also set aside for deputies from each of China’s 55 officially recognized ethnic minorities, as are a further 35 seats for returned overseas Chinese. The outgoing 12th NPC includes 699 women, making China’s supreme legislature 23.4 percent female. This number represents an increase of 62 female delegates from the preceding 11th NPC. However, given the overall reduction of the presence of women at the highest level of Chinese politics, it seems unlikely that the share of female members in the 13th NPC will increase in a significant way and it can be expected that women will continue to account for about 25 percent of the total. Of the total 2,987 total seats available in the 13th NPC, most are held by CPC members, but there are also representatives of China’s other political parties, such as the Revolutionary Committee of the Guomindang, and independents. While the NPC is the supreme legislative body of the PRC, its work is overseen by the National People’s Congress Standing Committee. Such is the political landscape of China that large government bodies often require smaller advisory sub-bodies that coordinate the primary flow of information and decision-making capacities. According to the constitution, the 150-member Standing Committee of the NPC is allowed to draft laws on the Congresses behalf, and can meet between the NPC’s annual meetings. This convention is due to the fact that, unlike in European legislatures, NPC delegates are not full-time politicians with their own offices, indeed they are not remunerated for their service on the NPC, but rather they are private citizens with their own careers and serve in a part time capacity. However, any change to the Chinese constitution requires a quorum of the full Congress. In addition to its legislative and organizational duties, the Standing Committee is also charged with establishing special membership quotas, so as to assure the representation of ethnic minorities or other potentially underrepresented groups. An important de facto function of the NPC’s plenary sessions is the publication and dissemination of work reports. In Chinese politics these reports serve the vital function of directing the massive mechanisms of state and defining the criteria for success and failure that various state organs are required to adhere to. It should be noted that this modus operandi is not limited to the NPC, but is also common in meetings of the similarly named National Congress of the Communist Party of China (NCCPC). Although de jure the highest legal entity in the land, the NPC is considered by some observers to be primarily ceremonial and the legislative process is often characterized as a “Rubber Stamp” for the CPC leadership. This is largely due to the fact that most of the seats in the NPC are held by members from the Communist Party. While not uncommon for states with a Marxist-Leninist legacy, this system does concentrate a lot of power over China’s policy direction with the CPC and its central leadership. This is especially important as a vital, if officially secondary, function of the NPC lies in confirming the party’s nominees for the senior position of state through elections at the first plenary session of the incoming Congress. The inaugural plenary session of the NPC is significant due to its timing within the Chinese political cycle, as well as serving as a point of contact between the population and state leaders. By law, the first plenary session of the incoming Congress must be scheduled within the first quarter of an election year, usually falling on the middle of March. It follows on the heels of the National Congress of the Communist Party of China, usually held in the autumn of the preceding year, which in terms of policy is the pivotal moment for Beijing. The prominence of the CPC within the state bureaucracy and at all levels of Chinese administration means that most major political decisions will have already been extensively discussed and negotiated internally, and by the time they reach the ratification stage, already been subject to extensive revision. The main function of the National People’s Congress is therefore, to approve or reject proposals on policy, and allow representatives of the general population a say in the direction that the affairs of state take. Although the CPC is one of the largest single political parties on earth, with an enormous membership of just under 90 million people, the sheer size of China’s population dwarfs this membership. Only about six percent of China’s 1.4 billion citizens are card-carrying members of the Communist Party. This means that in order to fulfill the obligations of the principle of universal suffrage, the NPC serves as a representative body that allows non-party members to participate in politics. Such conventions are not uncommon and most modern states make use of some form of indirect representation to reconcile the necessity of government with a desire by the population to have some role in the direction the state apparatus takes. What is less common, for political systems without a Marxist-Leninist underpinning, is a system which rests on the notion of legislative voting through approval or disapproval of a nomination for a position. This type of voting is sometimes called “consultative democracy,” the underlying rationale being that the popular will is expressed in the support martialed for a nominee. The voting process takes place at plenary meetings of the NPC and is defined by Article 52 of the Rule of Procedure of the NPC. The adoption of a bill only requires a simple majority of all the NPC’s deputies. After a bill is adopted, it becomes a law that needs a decree signed by the president of the PRC to promulgate it. However, in the case of amending the Constitution, a two-thirds majority is needed to successfully change the basis of China’s legal system. After an amendment to the Constitution is approved, it is put to the Presidium of the NPC and becomes valid from the day of final approval onward according to article 54 of the Rule of Procedure. A New Politics for a New Era? Although important to the institution of Chinese government, the composition of the 13th National People’s Congress and its inaugural meeting is unlikely to throw up any major surprises. Touted as one of the strongest leaders in recent Chinese history, President Xi Jinping is almost certain to be nominated and approved for the position of China’s head of state. Even for his first term as president, Xi won an overwhelming majority NPC delegates’ mandates, with 2,952 votes in favor, three abstentions and a solitary vote against, and given his popularity in the country and the conventions guiding the political process a similar turnout seems likely. However, a big question that remains unresolved for observers of Chinese political affairs, and likely even opaque to many cadres within the CPC itself, is the question of succession. It is precisely in this area that the 13th NPC may come to play a pivotal role. By convention, China’s top political leaders are barred from assuming office due to an age cap. Sometimes referred to as qishang baxia, translating to “seven up, eight down,” this de facto rule sets the retirement age for members of the CPC at 68. Although not codified in any legal documents, these guidelines have helped to shape the recent history of Chinese political development and served to prevent the creation of a gerontocracy reminiscent of the Soviet Union in the late 1970’s. In order to guarantee an orderly transition of power upon the retirement of a sitting president, an heir apparent is often appointed to the seven-member Standing Committee of the CPC’s Politburo, the party’s highest organ. However, Xi appears to have flaunted this custom, and his second term as General Secretary is characterized by an inner leadership circle made up of members who are all too old to take over the role of paramount leader upon the completion of the President-General Secretary’s second term. This fueled speculation that Xi will try to further break with tradition and attempt to run for a third term in 2021/2022. Subject of a brief press statement put out through the state media outlet Xinhua, it now appears evident that Xi Jinping intends to use the 13th NPC’s inaugural Plenary Session to revise a conditional clause in the Chinese constitution that limits presidency to a period of two-terms. The press release itself was tellingly brief, but within a few hours of being circulated there was a huge wave of international speculation and reporting. Interestingly, another equally short press statement, emphasizing Xi’s commitment to the national constitution of China, was publicly disseminated just hours before the proposed amendment to the constitution. This may hint at a strategy by the CPC’s top leadership to increasingly focus its governance reforms and legitimacy on the Chinese legislature and constitution, rather than on the informal mechanisms enforced within the party. That being said, it is still too early to tell which direction the Chinese leadership will head in, although it is possible to speculate about the potential trajectory. During the National Congress of the CPC in October 2017, the CPC constitution was amended by the addition of Xi’s works on political thought. It is not uncommon for the policy theories and directions of China’s top leadership to be included in this way, but what is unique is the inclusion by name of the author and the use of the term “Thought.” So far, the honor of being enshrined by name in the party constitution has fallen only to Mao Zedong and Deng Xiaoping, the latter of which was immortalized with the less assertive term “Theory.” Chinese officials have indicated through state media that they plan to amend the state constitution by submitting Xi´s Political Thought, along with Hu Jintao’s theory. Should such an amendment be passed, this would make Xi the first sitting Chinese president included in the state constitution by name since Mao Zedong. In the past, the PRC’s Constitution has served as a way for the Chinese leadership to restructure the state, and the highest government positions have been remolded in the process. Though it might be tempting to view China as a monolithic entity, with a history that runs back millennia, the reality is that it is a dynamic and ever-changing country. Time and again China’s government and the CPC have proved themselves willing to engage in political and economic experiments. As the de jure highest law-making body in the land, the National People’s Congress is well suited to take on a central role in the implementation of changes and the driving of new policy initiatives. Though there may be little doubt as to who will lead China, the question of how this transformation will be steered and what the politics of the future will look like remains an open question. What is certain, is that the much-touted New Era of Chinese politics dawns. Xiong’an: A New Model of Digital Chinese Urbanism? A “New” Chinese Foreign Policy Under Xi Jinping?